Maui’d Forever is one of Hawaii’s few full service, all-Hawaiian Islands wedding planner and coordinator. Founded in 2003 by entrepreneur Mark Steffan, the company operates on the Hawaiian Islands of Oahu, Maui, Kauai and the Big Island of Hawaii. They are now proud to offer a professional wedding musician on the Big Island of Hawaii. 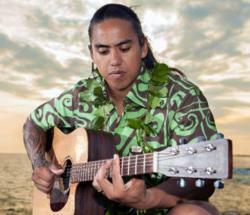 Our newest musician is Bula Akamu and he can be added to any Maui’d Forever wedding package for only $195. Bula grew up with a musical and entertaining family, playing Island, Hawaiian, Acoustic, Contemporary, Country and Reggae music. He graduated with a Masters Degree from Berklee College of Music where he studied music education and performance. Being part of Berklee Music, he discovered different types of genres but his passion will always be Hawaiian music. He enjoys writing and many of his original songs focus on the beauty of Hawai'i, passing it and its message onto today's generation. Today, Bula is a full time musician, playing nightly at various venues and weddings. He is also a Hawaiian Studies Kumu (teacher) and Music Director at an elementary school. He directs an Ukulele Ensemble which performs all over Kona and has won numerous awards. Bula is honored to play for weddings all over the island and be part of such a special day in the Bride and Groom’s lives. He will play any song by request in either ukulele or guitar. Bulas’ wedding music certainly adds a magical moment to a wedding, vow renewal or civil union service. His locations for most weddings need to take place in the Kona, Waikoloa or Kohala coast areas of the Big Island.